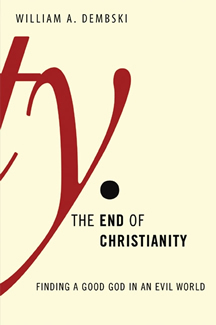 The End of Christianity, by William A. Dembski, was published in 2009 by B&H Publishing Group. Dembski is Research Professor in Culture and Science at Southern Evangelical Seminary and a Senior Fellow at the Discovery Institute’s Center for Science and Culture. As both a philosopher and mathematician, he is on the front lines of the Intelligent Design (ID) movement among scientists. His list of credentials and accomplishments impresses. With postdoctoral work at MIT, University of Chicago, and Princeton, Dembski has written over a dozen books, appeared on ABC News Nightline, BBC, CNN, PBS, NPR, and Fox News, and been cited by The New York Times and Time Magazine. He was interviewed for the Ben Stein documentary, Expelled: No Intelligence Allowed. The book’s subtitle is “Finding a Good God in an Evil World,” and it is a theodicy, attempting to demonstrate that God’s goodness is compatible with the existence of evil on earth, or, in other words, “to resolve how a good God and an evil world can coexist” (p. 4). Divided into five sections, it contains twenty-four chapters and 238 pages, including introduction and various indices. More than mere theodicy, Dembski’s goal is to outline a specifically Christian theodicy that defends three particular claims: “God by wisdom created the world out of nothing…God exercises particular providence in the world…All evil in the world ultimately traces back to human sin” (p. 8). The eye-catching title has nothing to do with Christianity’s demise, but, rather, its effect. “The end of Christianity, as envisioned in this book, is the radical realignment of our thinking so that we see God’s goodness in creation despite the distorting effects of sin in our hearts and evil in the world” (p. 11). One might suspect an author trained in mathematics and philosophy should not be the most interesting to read, but Dembski is no dull writer. He excels at casting deep theological and philosophical truths in easy-to-understand, creative, and thought-provoking ways, perhaps even reminiscent of C. S. Lewis. The initial four chapters treat the topic of evil, and Dembski offers many keen insights. In the face of critics who say Jesus could not fully identify with human suffering, Dembski defends the Cross as far more than the Lord taking a few hours of pain. “In particular, Christ on the Cross identifies with the whole of human suffering, and this includes the ignorance and uncertainty that intensify human suffering” (p. 20). “The extent to which we can love God depends on the extent to which God has demonstrated his love for us, and that depends on the extent of evil that God has had to absorb, suffer, and overcome on our behalf” (p. 23). Humans are to blame for both the presence of personal sin (i.e. disobedience to God), and the existence of natural evil (e.g. floods, disease, animal suffering, etc.). Says Dembski, “We started a fire in consenting to evil. God permits this fire to rage. He grants this permission not so that he can be a big hero when he rescues us but so that we can rightly understand the human condition and thus come to our senses” (p. 26). Sin forced souls into a state of disorder, which, in turn, came to be reflected in nature (p. 28). The evil and disorder apparent in nature are designed to impress people with the magnitude of the Fall in the Garden of Eden. Thus, “humanity must experience the full brunt of the evil that we have set in motion, and this requires that the creation itself fully manifest the consequences of humanity’s rebellion against God” (p. 44). It is not that we serve a petty God who holds grudges, but, rather, that we must come to terms with the seriousness and consequences of human sin. “The problem isn’t that God can’t take it but that we can’t take it—in offending God, we ruin the image of God in ourselves and so lose our true self” (p. 45). Chapters 5-9 deal with creationism from a young-earth and an old-earth perspective. “God gave humanity two primary sources of revelation about himself: the world that he created and the Scripture that he inspired. These are also known as general and special revelation, or sometimes as the Book of Nature and the Book of Scripture…We study science to understand the first of these books, theology to understand the second” (p. 71). Further, “God is a God of truth. As the author of both books, he does not contradict himself” (p. 72). Admitting that “Young-earth creationism was the dominant position of Christians from the Church Fathers through the Reformers” (p. 52), Dembski says he “would adopt it in a heartbeat except that nature seems to present such strong evidence against it” (p. 55). He sees a problem in that today astrophysics and geology posit an age of 13 billion years for the universe, 4.5 billion years for the earth. This model results in a world where animals predated humans by eons, and in which this animal planet was suffering the effects of natural evil. In other words, according to the current climate of accepted science, long before man arrived there were animals eating each other, dying slow deaths, suffering from parasites, drowning, falling in tar pits, etc. If humans are responsible for the existence of all evil on earth, then how could such evil exist before there were humans? The answer to that question is the gist of the book. More on that in a minute. Young-earth creationists have no dilemma in which the need arises to account for evil before man, since everything was created in the span of six 24-hour days. But Dembski thinks this cannot—at least in the current scientific atmosphere—be made to harmonize with accepted facts of geology and astrophysics. “Christians, it seems, must therefore choose their poison. They can go with a young earth, thereby maintaining theological orthodoxy but committing scientific heresy; or they can go with an old earth, thereby committing theological heresy but maintaining scientific orthodoxy” (p. 77). Taking young-earth creationists to task, Dembski accuses them of adopting a double standard, appealing to nature’s constancy when it helps their case, and denying nature’s constancy when it appears to hurt (p. 63). According to him, “Young-earth creationists, it would seem, hold to a recent creation not because of but in spite of the scientific evidence” (p. 70). Chapters 10-15 are about divine creation and action. Writing on the creation week, he notes, “At the end of the six days of creation, God is exhausted—not fatigued, as we might be, but exhausted in the sense of having drawn out of himself everything needed for the creature to be what it was intended to be” (p. 99). However, Dembski does not take the days of Genesis 1 to be 24-hour days, which brings us to his unique solution. Chapters 16-20 cover what he calls retroactive effects of the Fall. If, as Christians believe, the efficacy of Christ’s blood at the Cross could flow backward in time, as well as forward, then why not also the detrimental effects of original sin? Because God is not bound by chronological time, he could engineer the world to account for sin’s consequences, and allow those consequences to begin to play out long before Adam and Eve (who were the reason for sin’s consequences) appeared in the Garden of Eden. This intriguing suggestion would allow for an old earth, in which animals and natural evil existed long before humans. Evolution’s timetable could fit nicely, and even evolution itself since, as Dembski suggests, it is possible that part of sin’s result is that God had man evolve from lower forms, not because it was the original plan, but because evolution would itself be a form of evil brought on by man’s sin in the Garden, with God initiating evolution long before the Garden as a response to Adam’s sin (which was yet to be committed, chronologically speaking). As he puts it, “in the theodicy I am proposing, our evolutionary past would itself be a consequence of sin (i.e., evolution would be a retroactive effect of the Fall)” (p. 162). Remember, Dembski is not saying we got here by evolution, but he is saying that, with his proposal, theistic evolution is welcome at the table, along with old-earth creationism (with young-earth creationism seemingly the odd-man-out). It’s a bit of a mind-twister to think about this idea, somewhat akin to figuring out a time-travel plot in a science fiction movie. Writes Dembski, “God is under no compulsion merely to rewrite the future of the world from the moment of the Fall (as assumed by young-earth creationism). Rather, God can rewrite our story while it is being performed and even change the entire backdrop against which it is performed—that includes past, present, and future…In other words, the effects of the Fall can be retroactive” (p. 110). So, in a nutshell, natural evil is chronologically prior to man, but man is logically prior to natural evil. This proposed solution harmonizes modern scientific belief about the age of the earth with the biblical account of the Fall, thus preserving the doctrine that all evil on earth traces back to man’s sin, which is the third plank in Dembski’s theodicy. And this, even though the beginning of evil on earth predates the arrival of man. “Young-earth creationism attempts to make natural history match up with the order of creation point for point. By contrast, divine anticipation—the ability of God to act upon events before they happen—suggests that natural history need not match up so precisely with the order of creation…” (p. 137). But, if he is right, what about the creation account of Genesis 1? Dembski does not want to deny a literal interpretation of Genesis, nor does he want to suggest the day-age theory. He says, “Accordingly, the days of creation are neither exact 24-hour days nor epochs in natural history nor even a literary device. Rather, they are actual (literal!) episodes in the divine creative activity” (p. 142). But if the days are not days as we normally think of days, what are they? “They represent key divisions in the divine order of creation, with one episode building logically on its predecessor. As a consequence, their description as chronological days falls under the common scriptural practice of employing physical realities to illuminate spiritual truths (cf. John 3:12)” (ibid.). The days of Genesis 1 are, thus, to be taken literally, but not as composed of either hours or eons of time. Rather, they describe chapters of activity by a God unconstrained by chronologic time. Chapter 16 is titled “Chronos and Kairos,” taken from two New Testament Greek words, and Dembski uses them to distinguish between two concepts of time. “The visible realm thus operates according to chronos, the simple passage of time. But the invisible realm, in which God resides, operates according to kairos, the ordering of reality according to divine purposes” (p. 126). Again, “Chronos is the time of physics, and physics has only been around as long as the cosmos. But kairos is God’s time, and God has been around forever” (ibid.). “Thus God responds to the Fall by acting not simply after it, as held by young-earth creationism, but also by acting before it” (ibid.). So, the world we inhabit—affected as it is by sin—is greatly marred, for “God himself wills the disordering of creation, making it defective on purpose” (p. 145, emph. his). But why should the earth and animals suffer the effects of human sin? “The broad principle that justifies linking human sin and natural evil is humanity’s covenant headship in creation” (p. 147). Since man is creation’s apex, God holds man responsible for the results of his sin on himself, as well as the world. “God’s dealings with creation therefore parallel his dealings with humanity” (ibid.). Refusing to question God’s justice in allowing nature to suffer for human sin, Dembski turns it around to suggest it would be unjust if God were to allow man to sin without its consequences coming down on nature. “Sin has ignited a raging fire in our hearts. God uses natural evil to fight fire with fire, setting a comparatively smaller fire (natural evil) to control a much larger fire (personal evil)” (p. 148). The last part of the book, chapters 21-24, attempt to tie up “Loose Ends.” Dembski freely admits that “the present theodicy attempts to make peace between our understanding of Genesis and the current mental environment” (p. 170). The “mental environment” to which he refers is the current conception of a universe that began billions of years ago with a Big Bang. It is important to note that Dembski himself is not an evolutionist. And, as stated, he is a leader in the field among those in academia subscribing to Intelligent Design. Nor does he deny the verbal inspiration of Scripture. We appreciate his effort to defend God, Christ, the Cross, and the Genesis account of the Fall, as well as the existence and nature of evil. And, to his credit, Dembski rejects process theology, which reduces God’s infinity in order to account for the existence of evil (making God himself an evolving, and in some ways helpless, being). Dembski believes in and defends the God of Scripture. Thus, it is disappointing to see young-earth creationism endure a broadside (albeit a sympathetic broadside) from this proponent of Intelligent Design. Disappointment continues when Dembski writes, “Noah’s flood, though presented as a global event, is probably best understood as historically rooted in a local event (e.g., a catastrophic flood in the Middle East)” (p. 170). In the final analysis, we think Dembski goes too far in an effort to accommodate what parades under the rubric of modern science. His “kairological” interpretation of the Genesis creation account loads the text with more meaning than the language can bear (e.g. “the evening and the morning were the first day…the second day…the third day,” etc. ), giving rise to this question: If God had wanted to convey the idea of his having created the earth in six 24-hour days, how might God have written that? Further, Dembski’s proposed retroactive effects of the Fall (and even making room for the evolutionary timetable) does violence to the understanding of Bible believers across the centuries. Are we to think that truths as fundamental as the origin of man and earth were necessarily misunderstood by Christians until the advent of modern geology and astrophysics? We’ll continue to occupy and defend our acre where evolutionary theory is untenable, unwelcome, and unable to be harmonized with Genesis. If it comes to a duel between science (or, what passes for science) and Scripture, we defer to the apostle Paul’s timeless principle, “let God be true, but every man a liar” (Rom. 3:4). God is the God of true science, and of all knowledge. All truth (i.e. whatever accords with reality) harmonizes with all Scripture (since all Scripture is, itself, true). But science does not know everything it says it knows. And it is difficult to read some of Paul’s statements without the hubris of modern science springing to mind: “For it is written, I will destroy the wisdom of the wise, and will bring to nothing the understanding of the prudent. Where is the wise? where is the scribe? where is the disputer of this world? hath not God made foolish the wisdom of this world?” (1 Cor. 1:19-20). “O Timothy, keep that which is committed to thy trust, avoiding profane and vain babblings, and oppositions of science falsely so called” (1 Tim. 6:20). From your description, Dembski commits the fallacy of attributing to man what he attributes to God. The Cross did, apparently, have retroactive effect. This is divine doing. But nowhere that I know of does Scripture attribute any such effect to man’s actions. On the contrary, he was created as a being within time and space, and his actions are limited within them. His actions obviously may have eternal *consequences*, but that is a different order altogether. Dembski has discovered for us, then, the means of time travel!